Due to high demand bookings can only be taken for dates from the half term before the term that you wish to book. For example if you wish to book for the Spring Term (Jan-March) you will have to wait until after the half term of the term before (October). Current weekly Class Tutors can book at any time. If you wish to hire one of our studios, check on the calendar to see availability. Information that you need to provide in the email: Date of workshop, Title of workshop, Time of workshop, Cost of workshop, Description of workshop, Contact details for booking the workshop. All of this information will be displayed on our website. 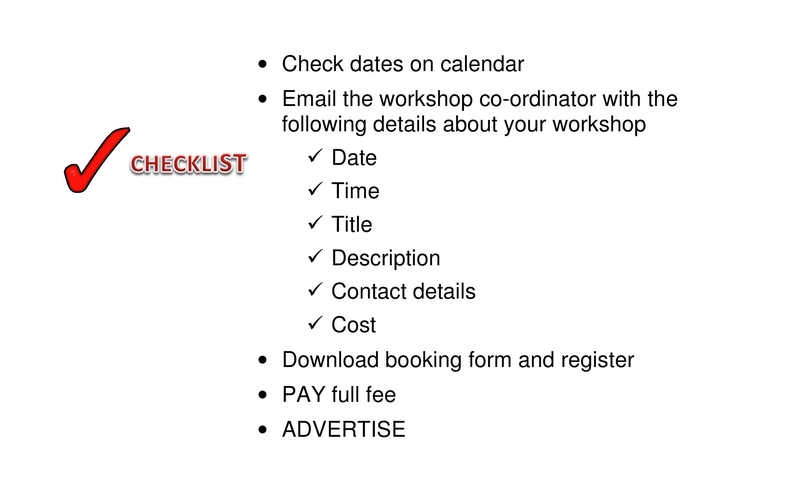 You also need to complete the workshop booking form which you can download by clicking the link below. This needs to be returned to the Workshop co-ordinator, Paddock Art studios, Paddock Lane, Lewes, BN7 1TW together with the full fee. You need to also download the attendance register by clicking the link below. You will need this on the day of your workshop. Don’t forget to take an envelope so that you can safely return the register. It is advisable to put up posters in and around the Lewes area at least 3 to 4 weeks prior to your workshop. If you have a poster or flyer, email or send this to us and we will put it up in the studio. NOTE THAT THIS MUST BE IN JPEG FORMAT for the website. The subject matter covered by workshops running at our studios must be related to the Arts and for adults only (16+). You need to liaise with studiohire@paddockartstudios.co.uk who will arrange for you to get a key. You must return the key after you have secured the building following your workshop, along with the register and money. All people attending the workshop must become members of the Paddock Art studios. There is an annual membership of £18 per year (see membership page) or there is a daily membership rate of £1.50. This covers the insurance. The facilitator of the course must also have membership. The membership cost is additional to the cost of the studio.